India is a country of contrasts, with cool mountains in the north, tropical plains in the south, and a heady mix of religions and customs in every corner. Not surprisingly, this cauldron of differences has produced a varied, complex cuisine that inevitably attracts the adventurous cook. The diversity of Indian cooking is melded into a single culinary tradition by the importance of spices in every dish. To stitch the culinary quilt together the following pages focus on the tawa and karahi, two pieces of cookware found in every Indian kitchen, along with the electric spice grinder. The Indian kitchen’s most commonly used spices and ingredients include cumin, garam masala, and ghee, and as each pinch of spice hits the hot tawa, you draw closer to the heart and soul of Indian cooking. Native to India, this pungent dried berry is thought to be the most widely consumed spice in the world. It has been used in India since ancient times, usually cracked or ground and added to foods to give them a touch of heat. A member of the ginger family, cardamom is a small pod with a thin, crackly covering and a number of tiny, round dark seeds inside. The pods can be green or bleached white. The seeds can be removed and the pod discarded, or the entire pod can be ground. Ground cardamon is also available, but some recipes may call for using the seeds whole. Cardamom, which is pungent and spicy with sweet tones, is used in both sweet and savory dishes. With the introduction of chiles to India in the sixteenth century, the “heat” in Indian cooking began to change, moving away from black pepper. Indians love their food spiced with chiles, and grow many different varieties. The Mexican chiles available in most supermarkets can be substituted. Typically, the smaller the chile, the hotter it will be. The cinnamon used in India is from the bark of the cassia tree, which is milder than the bark of true cinnamon. In northern India, rice is often seasoned with a cinnamon stick. Cinnamon is also used in garam masala, a custom blend of spices specific to every cook in India. The dried flower bud of a tropical tree, clove has a powerful flavor and scent. It’s one of the spices in garam masala; is used in sauces, especially with tomatoes; and is added to rice dishes. C oriander is used extensively in Indian cooking, both as a fresh leaf (cilantro) and a dried seed. The seeds are small, hard spheres that give off an intoxicating floral scent when ground. The mild flavor of coriander goes well with vegetable dishes, especially those made with tomatoes, eggplant, and carrots. C umin is considered the most important spice in Indian cooking. It is a small, curved, highly aromatic light brown seed that looks a bit like caraway. It is sold whole or ground. Toasting cumin seeds before grinding brings out their flavor. Cumin has strong citrus notes and is often added to neutral-tasting vegetables, such as beans, potatoes, and rice. Indian cooks typically mix up their own curry powders, choosing spices and proportions to their taste and according to the dish being seasoned. Curry powder is considered the original masala, or blend, of the southern Indian kitchen, whereas garam masala is the blend favored in the north. According to Indian food expert Julie Sahni, another blend, panch phoron, is popular in the kitchens of eastern India. Curry powder is used to flavor sauces and goes well with meat, seafood, and vegetable dishes, especially tomatoes. Fennel seeds look a little like cumin, without the curve, but the sweet licorice aroma and flavor couldn’t be more different. It is used to season vegetables and for sweets. In Hindi, garam means “warm” or “hot” and masala means “a blend of spices.” The spices included in this blend vary by region, by cook, and by the dish to which it is being added. Every Indian cook creates his or her own blend, which can have as few as ten or as many as thirty different spices. In the United States, you can buy already-ground garam masala in jars or packets or mixtures of whole spices. Whole-spice mixtures typically include bay leaf, cinnamon stick, brown mustard seeds, green cardamom pods, whole cloves, and cumin seeds. 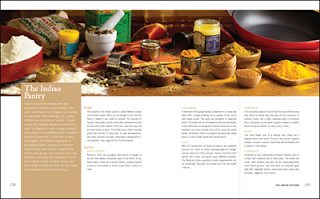 The spices are always dry roasted on a griddle (tawa) or small skillet before they are ground in an electric spice grinder or, for smaller amounts, in a mortar and pestle (see page 129). Fresh ginger, with its familiar pungency and heat, is used widely in Indian cooking. It is typically peeled and then grated, chopped, or thinly sliced before adding to dishes. It is a popular seasoning in lentil dishes, various curries, and chutneys. M ustard seeds come in several colors, but small brown seeds are most often used in Indian cooking, especially in the vegetarian cooking of the south and in traditional Indian pickles. These small, black, pungent seeds are sometimes called black onion seeds, though the onion is not a relative. They are used in stir-fried vegetables, pickles, and in dals, dishes made with dried split lentils, peas, and/or beans. Turmeric, a rhizome like ginger, is commonly dried and ground into a brilliant golden yellow powder with a strong earthy taste. It is the spice that gives curry powder its distinctive color. It is also a common addition to vegetable, rice, seafood, and meat dishes and to pickles.